Smarter, Faster, Stronger: Let’s Workout! A lot of people tend to think of the mind and body as separate entities, when in fact what can be good for one (body) can also be good for the other (brain). After all, the mind and body are both parts of you, and you are one complete, connected being; the same blood that travels to your brain also travels to those killer quads. In fact, many studies have shown that regular exercise – at least 10 minutes 3x a week – is linked to improved test scores, focus, memory and cognitive reasoning. Exercise has also been proven to aid ailments such as ADHD, inflammation, depression, stress and age related cognitive decline. For children that suffer from ADHD, exercise helps the brain focus, calm down and develop properly, while at the same time burning away extra energy and releasing beneficial endorphins like dopamine and serotonin.Exercise also has anti-inflammatory properties for the heart, joints, brain and eyes. For those individuals that are suffering from stress or depression, exercise is an effective antidepressant due to the release of endorphins – but that doesn’t mean it can replace your medication. Exercising also increases the body’s ability to handle stress.When you exercise, the symptoms of cognitive impairment, dementia and Alzheimer’s are slowed, and sometimes even reversed. This is because working out helps your body remove plaque and debris from the brain, which rejuvenates cells, encourages your body to produce more brain cells and promotes connections between neurons; this means that your memory and learning capacities are increased. Along with aiding particular ailments, exercise is beneficial purely for the fact that it helps your body as well as your brain overall. When you engage in cardio, blood gets pumped through your body and your heart becomes more efficient due to necessity. Your brain gets more oxygen and energy, thus improving attention, productivity, endurance and focus for several hours after working out. Try to partake in some exercise rather than chugging a coffee before studying, taking a test or during that middle of the day slump, you’ll be amazed at the results. I can’t stress enough the importance of exercising. It only takes a few minutes a day to start, and soon you will find yourself improving and impressing yourself with your capabilities. The mind and body are terrible things to waste, so work on working them out. Sweet potatoes are root vegetables that are often overlooked. Sometimes, you may come across sweet potato fries, but that is about as mainstream as these guys get. Well, hopefully that is about to change! I stumbled upon a recipe for Sweet Potato Pancakes not too long ago, and thought it would be a fun and easy recipe to share with all of you. A different weekend breakfast project, perhaps? In a blender, mix pancake ingredients. Batter will be thick. Pour out 4-5 pancakes on a hot griddle – medium to low heat. Mix frosting ingredients and heat in microwave for 5-10 seconds. Melt 1/2 tbsp of almond butter and pour on pancakes for final touch. Not so bad, right? RIGHT. I recommend all of you at least try this. It can’t hurt, and with 30 grams protein, 39 grams carbohydrates, 322 calories and 6 grams of fat, these pancakes are healthy, delicious and a heck of a lot better for you than the ordinary pancakes. Let me know how it goes if you take the leap! x’s and o’s as always. You’re just going to want to read this. What’s going on mes amis? Are all of you beautiful beings surviving the infamous “hump day”? If you’re struggling, never fear, it’s almost over! If you live on the East Coast, that is. Sorry Westerners, but you’ve got a few extra hours to endure. 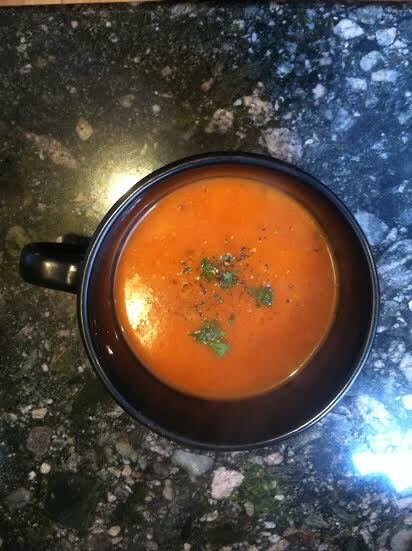 In an effort to lessen the pain of the Winter Wednesday Blues, I thought I would share a tasty soup recipe with all of you, because who doesn’t like soup during the colder months? Especially when it’s loaded tomato soup. 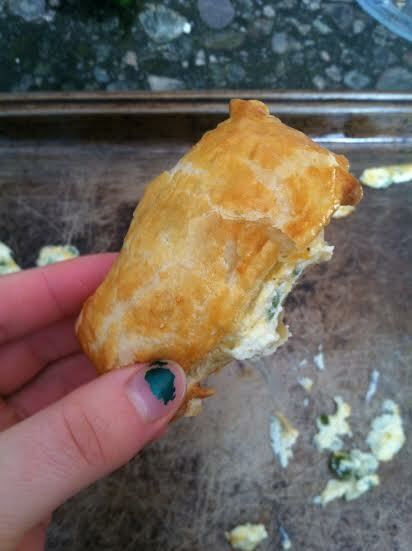 I made this the other week and well, I thought it was delicious; my family seemed to be in agreement, too. Plus, you know exactly what the ingredients are… and they’re good for you! In a heavy bottomed pan, heat EVOO, then add garlic, cumin and onion. Cook until onions are soft, about 3 minutes. Add crushed/canned tomatoes and 1/2 t salt. Crush tomatoes as much as you can during this step. Add stock/water and bring to a boil at high heat. Once boiling, bring down to a simmer and let sit, covered for 20 minutes. Puree the soup in one or two batches to make it smooth. I used my Vitamix for this. Return broth mixture back to pot (strain if you feel this is necessary, I didn’t), add the rice and chickpeas and cook on stove until everything is warm and ready to eat. Serve in a bowl and garnish with parsley/cilantro. Devour! 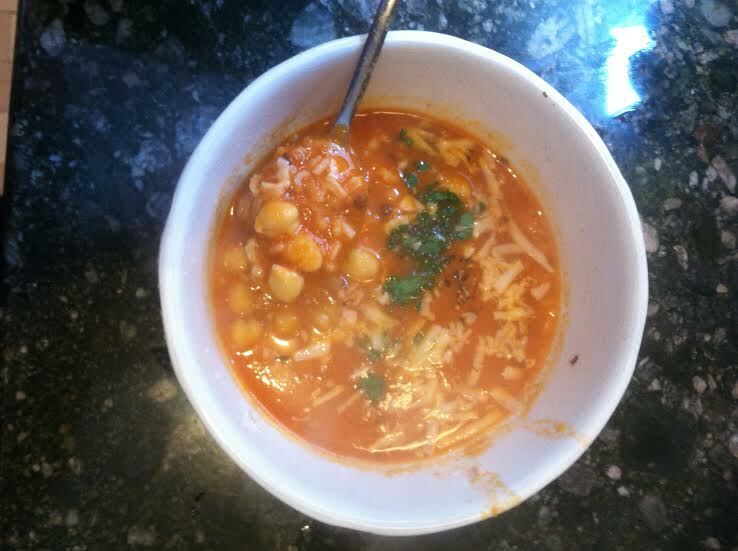 If you aren’t the biggest fan of chickpeas, this is a great way to start becoming accustomed. If you really hate them, you can easily substitute with chicken – I would recommended small chunks or even shredded. Well, that’s all I’ve got for you lovely individuals tonight. I am extremely sore at the moment – I climbed and worked out at the regular gym yesterday and then went to the regular gym today – so my agenda for the rest of the night is as follows: turn on heated blanket –> watch Grimm –> sleep. Coming to you live from the snowy regions of New England. Yet again, Old Man Winter is walloping us. You would think living in Vermont for 4 years I would be used to this, but alas, I am not. It’s just not in my DNA to get accustomed to the cold. Ever. At least it’s pretty? I’m still pretty stoked about the New England Patriot’s Superbowl XLIX Championship Win yesterday, along with the rest of New England residents. In keeping with the theme, I wanted to share with all of your the tasty treats I made for my Superbowl party last evening. They were a hit, so I figured it would be nice to pass on the yummm. My posing wasn’t the best and my boyfriend wasn’t the most enthusiastic of photographers, so unfortunately this is a mediocre shot. 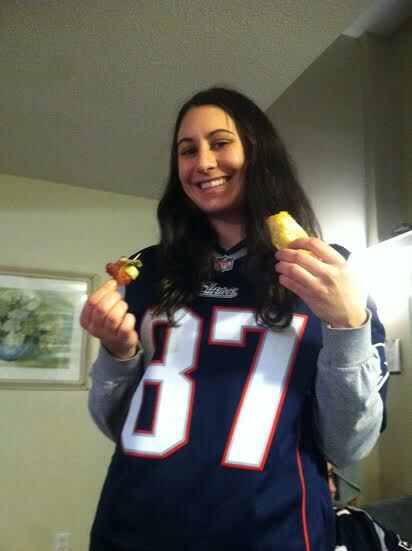 However, the food is the star anyway, so here’s what I’m holding: bacon wrapped smokies and jalapeno pillow puffs. Care to know more? 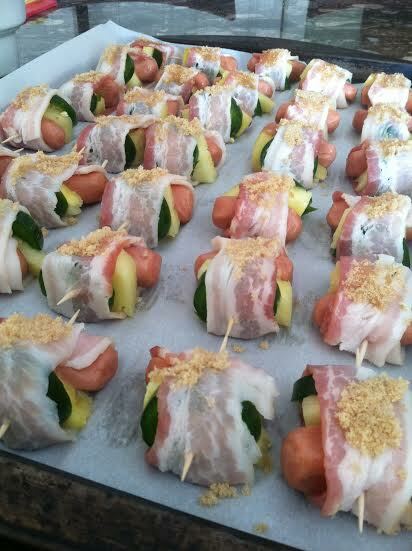 Those little beauties are the bacon wrapped smokies. Honestly, they were the overall hit of the party (not to toot my own horn or anything…). People loved them and they were devoured pretty quickly. The best part? They’re so simple to make! I won’t lie, they’re a bit time consuming since you have to wrap each one with care (and love), but it’s 100% worth it and I will definitely be making these again. If you want the detailed recipe, let me know! 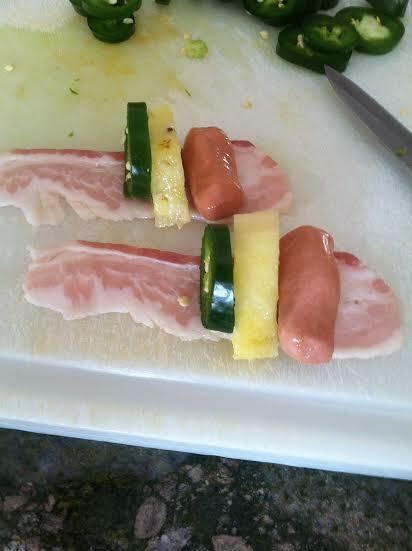 In a nutshell, it’s a smokie, piece of pineapple and slice of jalapeno wrapped up in bacon, secured with a toothpick and sprinkled with brown sugar, then baked in an oven at 425 for 17-22 minutes. VOILA. 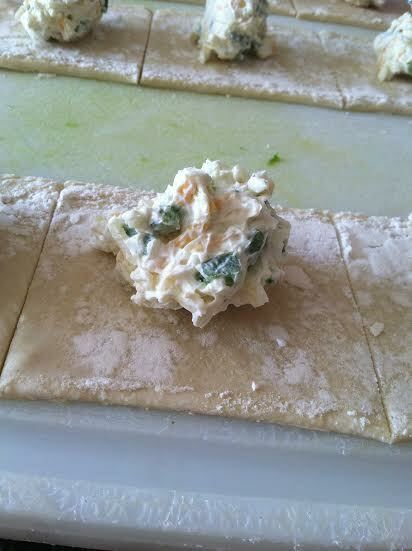 Next up are the Jalapeno Pillow Puffs. These were amazingly delicious and once again will be added to my recipe arsenal; it also happened to be my first time playing around with pastry puffs. I was a little nervous at first, and for good reason: pastry making is hard! You have to watch them like a hawk and even then, they are tricksters. GO PATS! WE ARE THE CHAMPIONS! WOOOO GO PATRIOTS!!! SUPERBOWL XLIX CHAMPIONS!! !